Whether taking a small nature walk through the woods or trekking down 7th Ave., Geox has designed a Hybrid Hiking Boot to channel your inner lumberjack in a feminine way. 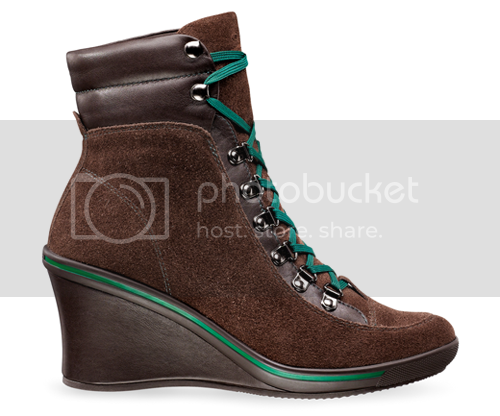 This boot incorporates a couple of my favorite shoe styles; a wedged heel and laces. And you guys know by now that I love laces! The perforated rubber outer sole coupled with a special micro-porous membrane placed on the top, allows for your feet to stay warm, breathe comfortably while keeping the elements of rain and snow out. Walking around with wet feet is definitely not cool! Geox's Hybrid Hiking boots are not only offered in brown as pictured above, but is also available in purple and black color-ways. They retail for $190 and are available at www.geox.com. I must say, I'm more partial to the brown color. I would love to know how you feel about these? Do you like them? If so, which color are you digging? Wonder how I would wear them? Simple. With a few of my fav Fall/Winter staples you can have yourself a fab chick approved look in no time. I actually really like those. I'm partial to the brown but I think the purple would be a fun look to incorporate different colors. They look super comfortable.